Speeding in Burn? What speeding? According to police, there is not a speeding problem in our village. Despite the findings described in the article below, members of the parish council were told recently that the village does not have enough accidents or casualties to be considered a speed-check priority area. The parish council has asked police again to carry out further speed checks and we have asked for another black-box traffic survey. But we need residents’ help in making that happen. You can download a form from the 95 Alive campaign which was introduced in 1994 to make York and North Yorkshire’s roads safer – and the more people who fill in a form, the more chance we have of getting police action, so please ask every adult (over 18) to complete their own. Once completed, please return to your nearest parish councillor or hand in at The Wheatsheaf for us to collect and send all together to North Yorkshire Police traffic management office. 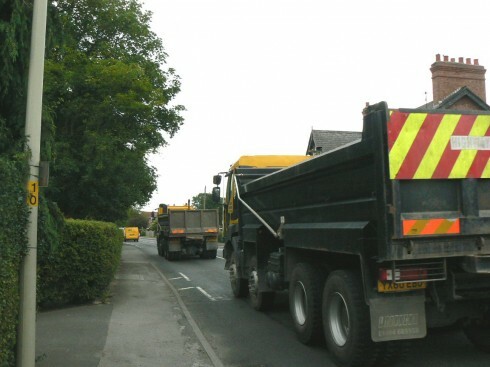 A survey undertaken in Burn in the autumn of 2008, following the opening of the A63 Selby by-pass in 2004, revealed a considerable increase in traffic, much of it heavy lorries, on the A19. More than 12,000 vehicles a day were coming through the village causing constant vibrations in homes, damaging property and quality of life. • 95 per cent of people living on the A19 who replied felt ground tremors and all reported traffic vibration in their homes. In the survey, to which more than 75 per cent of households responded, many residents revealed their homes showed cracks and damage; some said their health was suffering from the noise and stress; and mothers with prams said they were afraid to walk the village. One of the organisers Bill Hearld (now a Burn Parish Councillor), says: “Traffic through Burn has reached totally unsatisfactory levels and the village has to do something about it. We must have been the only village to have slept through the 2008 earthquake because we get that all day and night. “The village lost its chance of a by-pass when Yorkshire Forward withdrew a promise of funding, which meant North Yorkshire County Council could not proceed with existing plans for the work. NYCC now says it has no money for a by-pass for Burn and now (2011), with the abolition of Yorkshire Forward, the possibility has faded even further. However, we are involved in discussions on the future of Burn airfield with the relevant authorities and will lobby at every opportunity for any development scheme proposed for the airfield to include a by-pass. More recent surveys involving ‘black box recorders’ have indicated vehicles, including heavy lorries, speeding through the village at more than 50mph in some instances. Copyright © 2019 Burn Parish Council. All Rights Reserved.